It offers a smartphone app to get enjoy sake by everyone in sakefan World. Released the iPhone version in 2015/10/22 As a first step! Android version is currently under consideration. 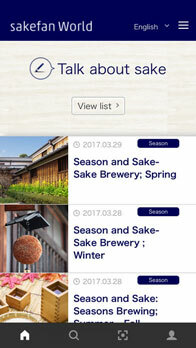 In the smartphone app, area has to offer on the Web site, in addition to the brewery, is seen information of Japanese sake, it has the following features of the app unique. By all means, please try once. Compatibility　Requires iOS 7.0 or later. Compatible with iPhone, iPad, and iPod touch. When holding the camera screen in the app on the label of sake, search for the sake in the label to display the sake information. This is okay to not read the label! ※label that you can search is only to those that are registered in sakefan World. Registration label it’ll add at any time. You can save the drinking history in association string sake information. The history date and time, stocks, notes, photographs are available registration. Also, you can easily tagged sake anxious by tapping the ★ of sake information screen. Tag is subjected sake can be referenced from Favorits List, you can see the easy sake information from there.